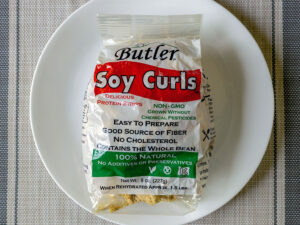 Butler Soy Curls are one of our favorite products when it comes to reducing how much meat we’re buying and eating. 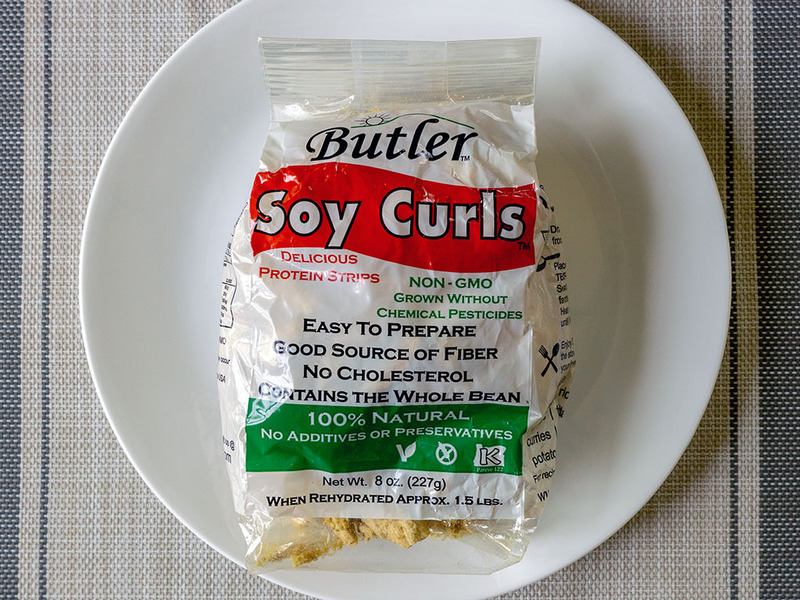 Whether you’re looking to cut back on your meat intake for diet, budgetary or ethical reasons, these soy curls will definitely leave you happy. The curls are flexible enough to be used in a variety of ways; ost importantly they’re an amazing foil for a range of flavors. These three extra steps – infusing the soaking water, wringing dry and then cooking in another flavoring – help to add multiple layers of flavoring to the curls. The curls really are chameleons when it comes to flavor, they’ll happily adjust to whatever you throw at them. Thai food is one of our most favorite cuisines to prepare – its healthy, fast and a riot of flavor. Soy curls are a perfect addition to any Thai curry dish. Once your curls are soaked and ready, you can add them directly to any vibrant Thai sauce, whether a luscious green curry or drier red jungle curry. In the dish pictured above I simple followed the basic cooking method and added the soy curls to my dish of red jungle curry for a few minutes before service. The curls eagerly soaked up the bold flavors of the dish. There are lots of products on the market for a meat free pulled pork experience. 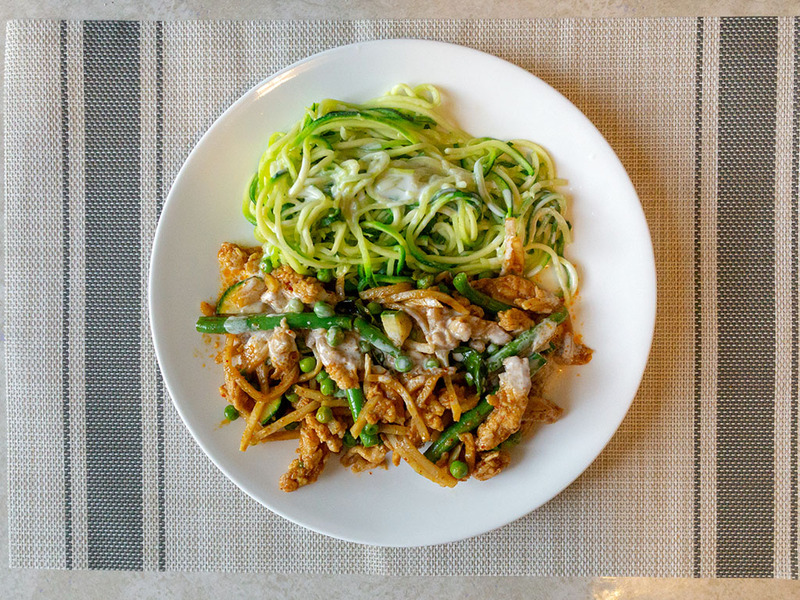 While you might have had success in the past with jackfruit based pulled pork or perhaps a product like MorningStar Farms vegetarian pulled pork – in our opinion, soy curls are hands down the best. I like to add a little smoke powder and tamari during the soaking process. From there, I wring the soaked curls as dry as I can and fry at high heat with a good quality BBQ sauce; just enough to start carmalezing and slightly charring the edges of the curls. 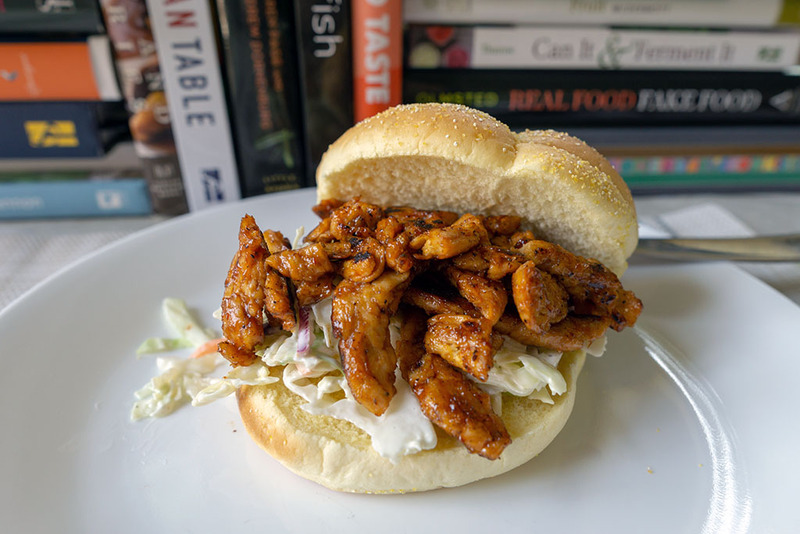 Served on a hearty bun with rich coleslaw, even meat lovers would be hard pressed not to enjoy this preparation. 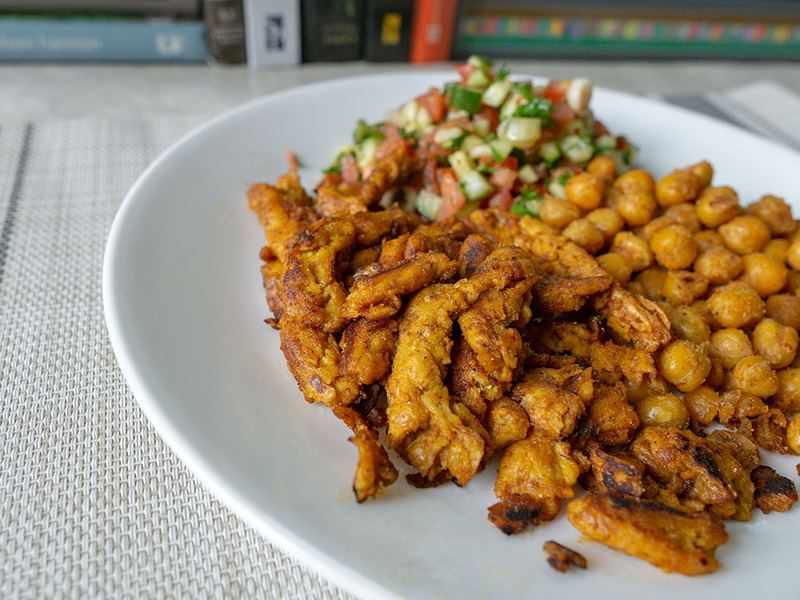 In the picture above I’ve served the curls with pan fried chickpeas and a tabbouleh-esque salad of diced tomato, cucumber, parsley and green onion, seasoned with olive oil, cumin, coriander, salt, red pepper flakes. I soaked the curls in garlic powder and ras el hanout seasoning before pan frying with more ras el hanout and a little hot sauce. Harissa would be perfect here! With this dish I soaked the curls in vegetable stock and a host of tikka inspired spices: cumin, turmeric and cayenne powder. From there I soaked them dry and fried them in grated ginger, garlic and a little curry powder. 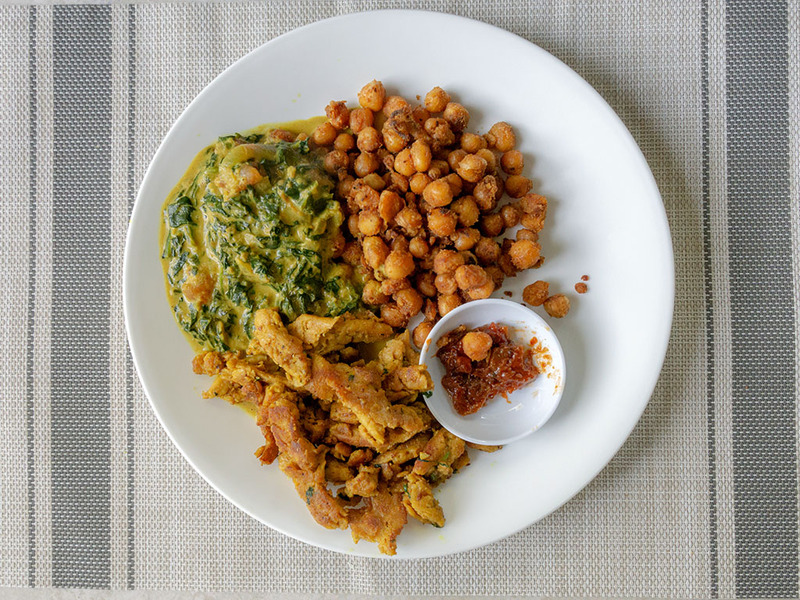 Served up with a home cooked saag curry and pan fried chick peas, curls make a great stand in for meat.